Youth Symphony Orchestra is the leading orchestra ensemble of SFYSA. Members play a range of music, from the orchestral classics through works written in the 21st century. YSO has performed with world-renowned artists such as Mark O’Connor, Guillermo Figueroa, and Bobby McFerrin, and collaborated with organizations such as the Seattle Rock Orchestra, the Ying Quartet, Moving People Dance Company, Denver School of the Arts, Colorado Springs Youth Symphony, Albuquerque Youth Symphony, and the Santa Fe Fiesta Melodrama. Each season, the YSO aims to go on tour. Recent tours have included performing at the White Sands Full Moon Concert series and Las Cruces, Seattle and Northwest Washington, Colorado Springs and Denver, the Czech Republic and Germany, and San Francisco. 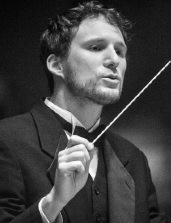 William Waag is in his fifth season as Conductor of the Santa Fe Youth Symphony. A passionate music educator, he also works as a guest clinician and support in the music classrooms across Northern New Mexico. William’s recent guest conducting engagements include the Albuquerque Philharmonic, Seattle Rock Orchestra, Santa Fe Symphony, El Paso Symphony Youth Orchestra, Albuquerque Youth Symphony Reading Orchestra, and Honor Orchestras in New Mexico. William has held a variety of conducting and teaching positions ranging from elementary and secondary schools to colleges, public and private institutions, and four states across the western US. He has lead wind ensembles, jazz bands, symphony orchestras, music education courses, music theory, special education, and pre-school music. Above all these, William’s passion is for conducting youth symphonies. Previously with Kittitas Valley Youth Orchestra (Washington), and Anchorage Youth Philharmonic (Alaska), William is so pleased to be guiding the Santa Fe Youth Symphony to creative collaborations and expanding every aspect of the youth symphony experience. William received a MM in Orchestral Conducting from Central Washington University, and a BM in Music Education from Boise State University. Originally from Boise, he lived in Seattle, and Anchorage before moving to Santa Fe. A true native of the Pacific Northwest, he loves exploring the mountains in all seasons with ski poles in one hand, and espresso in the other. In his free time, he can be found traveling the New Mexico highways in his 1972 Volkswagen bus.